Silver prices haven’t done well since the beginning of 2018. Year-to-date, the gray precious metal is down over 17%. One has to wonder, what’s next? In the short term, the outlook for silver prices seems bearish. It wouldn’t be shocking to see silver prices face more scrutiny in the coming weeks and months. Please look at the chart below. It plots weekly silver prices. 1) Silver prices trade well below their 50-week and 200-week moving averages. This is saying that bearish sentiment prevails. Remember, the trend is your friend until it is broken. Right now, the trends are pointing downward and traders could continue to trade in that direction. 2) The gray precious metal prices broke below a support level that was in play since mid-2016, at around $16.00. Remember this rule of technical analysis: When support breaks, it becomes resistance. Even if silver prices are able to bounce back from the current level, they may face some headwinds around $16.00 now. Also, when support breaks, prices tend to fall to the next big support level. That’s at around $13.60 in this case. If silver prices break below $13.60, the next support level isn’t until around $10.00—lows made in late 2008 and early 2009. 3) When you look at momentum indicators like the moving average convergence/divergence (MACD) indicator and the relative strength indicator (RSI), they suggest that sellers dominate in the silver market. They are controlling the silver price and could take it lower. While looking at the chart may make investors nervous even thinking about silver, it can’t be stressed enough: the gray precious metal shouldn’t be ignored. The downside may not be as big, but the upside could be immense. It wouldn’t be shocking to see the same in 2018. Know that the demand side isn’t calming down anytime soon. Silver is not just a precious metal like gold; it has industrial uses as well. It is used in cell phones, pharmaceuticals, solar technology, and for many more industrial purposes. Cell phones are being used more than ever now, solar technology is gaining a lot of attention these days, and the pharmaceutical sector isn’t going anywhere anytime soon. A lot more silver could be needed. Dear reader, it’s important to look at silver from a risk/reward perspective. 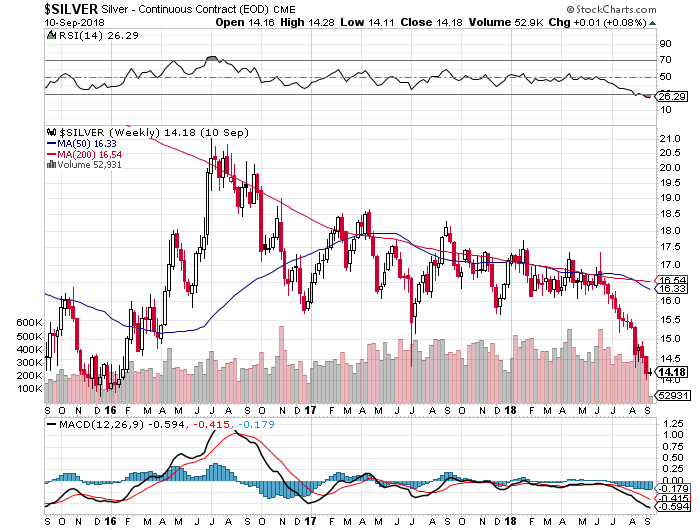 How low could silver prices go? If you look at the average cost to produce an ounce of silver, it’s between $12.00 and $14.00 an ounce. If silver goes below that, we could suddenly see supply shocks. So, from the current price, the risk is about $2.00–$3.00. How high could the silver prices go? The gold-to-silver ratio currently trades at 84.61. The long-term average is around 45.00. Mind you, the gold-to-silver ratio essentially tells us how many ounces of silver it takes to buy an ounce of gold. Investors use it to value silver prices. If we assume the gold-to-silver ratio goes back to its historical average and assume that gold prices remain the same at $1,200, then silver prices would have to go above $26.00. That’s $12.00 or 46% above the current price. So, the reward is around $12.00 an ounce.